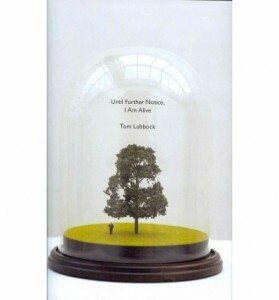 Tom Lubbock was an English writer and illustrator who worked as the chief art critic of the Independent from 1997 to 2011. In 2008, Lubbock was diagnosed with a malignant brain tumour and given only two years at the most. Until Further Notice, I am Alive reveals his journal entries during his illness and demise, as well as an article he was commissioned to write for the Observer about his illness. When I picked up this book, I wasn’t sure if I would be reading a detailed story of a man’s journey through his illness and loss of language, or if it would focus on something else and leave the particulars of the disease and his treatment to the side. What the reader receives are honest snippets as to Lubbock’s mindset throughout, his philosophical thoughts on death and dying, and his contemplation of a future which has no place for him. The honesty of this book immediately grabbed me, as did how calm and measured Lubbock seems to be in his acceptance of what is happening to him. He states himself that perhaps he came to a feeling of acceptance too soon, that he completely skipped the denial and anger stages, and after reading an article he even questions whether stoically accepting one’s death is simply the fashionable thing to do. Had these comments come from someone not on the brink of death, they would be seen as insensitive and out of line. Yet to me, this is also the point Lubbock is making: how dare society dictate how one should feel faced with impending death. If he is to accept his death, it is because he wants to, and not because he feels that that is what he should do. There are, of course, times where Lubbock is angry and frustrated at his predicament, especially when his language starts failing him, yet he still manages to record these thoughts civilly, without letting his anger dominate his craft. His anger comes across in shorter sentences, shorter anecdotes and more factual, rather than reflective, writing. Lubbock carefully steers clear of injecting too much hysterical emotion into his writing, and it is hard to know if this is conscious or simply the way he felt as he was writing. He wrote his diary with the idea that it would perhaps one day be published, which could explain why his writing is so measured. He writes down the facts of his treatments, his fits, his struggle with language, recording the physicality of his illness rather than the emotion. Lubbock had a wife and a young son, and he constantly remarks that his son will probably remember nothing of him. He isn’t concerned for himself, in death, but for his son, who will be robbed of his father before he is even old enough to have a solid memory of him. This book is such an insightful read. Too often terminal illness is trivialised or romanticised or inaccurately portrayed by film, TV and fiction, where the repetitive routine of hospital appointments, treatment and waiting for results and news, good or bad, is lost in the drama of everything else going on in those fictional worlds. Here, Lubbock’s journal entries give a glimpse of the everyday realities of knowing that you’re dying, and that any treatment you have is just another attempt at prolonging your life for another few months. The novel’s title comes from an incident shortly after Lubbock’s diagnosis, where he spends the weekend explaining his situation to his friends, telling them that he is dying. That evening, Lubbock’s wife firmly tells him that she intends on spending another ten years with him. Lubbock realises the fault in his thinking and sends an email to his friends, explaining, ‘so, until further notice, I am alive.’ Lubbock acknowledges that despite his expected two years, you never know, and there is no point in thinking himself to death. This book is a truly wonderful read which refuses to be bogged down by the dark subject matter. Lubbock is perceptive and reflective on his illness, on death and on dying, questioning everything, and sharing with the reader his final three years of life. It is extraordinary that even after Lubbock’s language started going, he continued to write, that even though it was such a struggle, it gave him so much pleasure that he never contemplated not continuing to write. It was simply a question of how to keep going while he still could. Until Further Notice, I am Alive is published by Granta Books. This entry was posted in Arts, Books and tagged book review, books, cancer, death, granta, literature, Review, Tom Lubbock, until further notice I am alive. Bookmark the permalink.